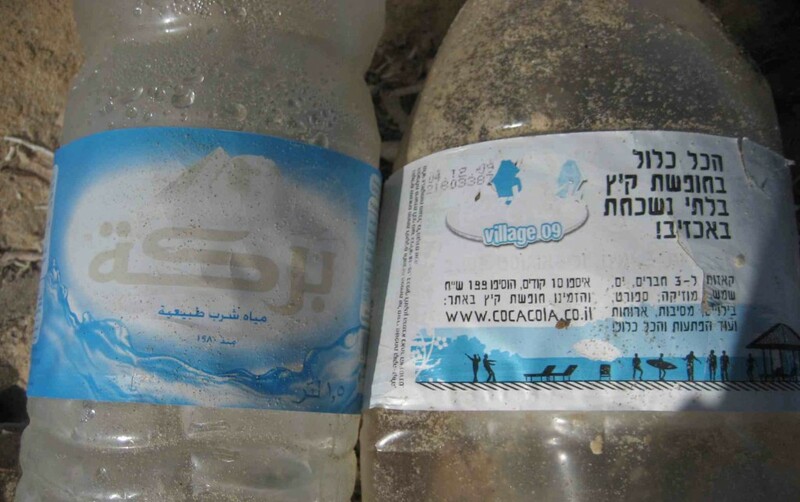 Plastic bottles (in Hebrew and Arabic) wash up on the shore of the Red Sea in Sinai, Egypt. In this region water and pollution knows no boundaries. How can Israel be part of the change? Is Israel a water hog, unjustly siphoning aquifers from its neighbours? Does it take more than its share? Or does it have political justification for managing its resources? Can water resources be developed so that all in the region have water security, with Israel as an instigator of change, perhaps? With a leading spot in the water industry – from desalination technology to water saving technology – Israel has been getting a bad rap from the media and NGO reports, despite the fact that the country is attempting to cooperate on water issues despite the difficulties. Dropping deep into the well of water experts in Israel, Green Prophet was asked by the Strategic Foresight Group (SFG) based in Mumbai to interview the country’s top experts in water. The aim is to find ways Israel could help promote water security in the region. And to take this information to high level policy makers. We’ve interviewed the country’s Water Commissioner’s office, the heads of top NGOs like Friends of the Earth Middle East, and researchers who know Israel’s water story from working in the field. Over the next week or so, Green Prophet will be highlighting these different experts, who were posed with five questions directed to long term sustainable solutions. We hope this series will be an invaluable tool for local and international journalists, and international policy makers involved in the Middle East region. Green Prophet will be happy to give contacts to these people to those who ask. We also hope it will be interesting for Green Prophet readers who know that ‘water’ is one of, if not the most important issue, in the Middle East-MENA region. To know more about the project, we’ve collected more from the Strategic Foresight group, below. This is the same group that penned the report on the Cost of Conflict on the Environment in the Middle East. The following series on Israel’s Water situation was initiated by Strategic Foresight Group (SFG) with assistance and guidance from Green Prophet. SFG is a political think tank in Mumbai India that works on global future issues. It is currently conducting a study on water security in the Middle East. This study is formally supported by the governments of Sweden and Switzerland and several other governments have offered their support informally. In the course of its research, SFG drafted a set of five pertinent questions for each of the countries involved in the study. The questions pertain mainly to ‘sustainable’ and ‘collaborative’ water solutions that could help mitigate a future water shortage crisis in the Middle East. The idea is to engage experts and people knowledgeable in this field, in order to gain their perspectives and opinions on the subject. In this particular segment, SFG and Green Prophet deal in particular with Israel’s water situation and how it relates to larger regional water issues. We have posed five questions to academics, policy-makers and activists in Israel and collated their respective responses. We welcome you to participate in the discussion and share information and viewpoints that will enrich the dialogue on water in the Middle East. The idea is to promote a positive forum for communication, so that regional leaders will eventually be able to see eye-to-eye in order to solve imminent water problems shared by all. SFG will take the comments received here into account while formulating its report. SFG and Green Prophet will also be disseminating the blog link to partners, contacts and associates. Image credit: Green Prophet, 2009. Previous Previous post: Oil Find Outside Tel Aviv: A Blessing or Ecological Nightmare? Israel is famous for fooling the world into thinking that it is a water-efficient country. It isn't. The SFG might consider some of the ideas put forward that I have come across:-raise the domestic and commercial prices of water. Israel has subsidized the cost of water and artificially suppressed the cost. The result has been massive over-consumption that has no relationship to the real supply/demand situation. Yes, you may have to pay subsidies to weaker economic sectors so they are not badly affected, but if you don't have a vast water supply, you simply can't keep selling your existing supply at bargain rates.-ban the growing of water-intensive crops. Despite the water shortage and high cost of production, Israel still grows cotton – a water intensive crop that has to be subsidized in order to compete on world markets. Why? Because Israeli part of the agriculture industry invested tens of millions of dollars in cotton producing equipment in the 20th century, and they don't want to lose all that investment. So as a result, we use water we don't have to grow cotton that we can't sell, in order to keep a few hundred farmers in business.-introduce legislation to reward citizens and businesses that use gray water. Israelis use fresh, expensive drinking water to flush their toilets. The government should not just allow a tax write off, but should pay a bonus to anybody who uses gray water to flush their toilets. This would be cheaper than building an energy-intensive desalination plant.-pay the country to install water saving equipment. Water taps in the country waste vast amounts of water because too much volume comes out. There are cheap and easy solutions on the market that aren't being used. Reward people who install the solutions.-Pay the country to install artificial grass instead of real grass. It's the same principal as paying tax rebates with a bonus for people to install and use gray water equipment. If you don't have grass, you don't have to irrigate it. If the rains do return and the water tables and Sea of Galilee refill, then sure, people can start to water grass when that happens. Until then, however, watering lawns should be banned.-Pay people to install dew and fog water collection devices using tax rebates with cash bonuses. These are generally static devices that sit there and produce water. Israel has many foggy areas and that fog can be harvested. As well, the Jewish religion recognizes the importance of dew for life, and there are daily prayers for dew and rain that are an integral part of of Judaism. as i know israel has very serious system of cleaning of water. and as i know israel is gonna provide cleaned water to our neighbors-so we will have part of their water too and they will get water of much higher quality.